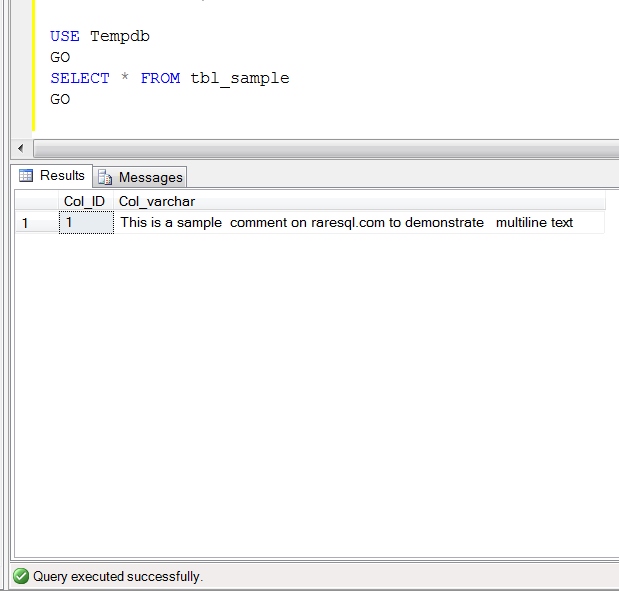 I came across this query ‘how to add & view multiline texts in any varchar field’ when our team was migrating a customer data from legacy system, and one of our team members tried to update the comments field in a column of a table. Before processing with the solution, I would like to create a sample table to demonstrate the solution. 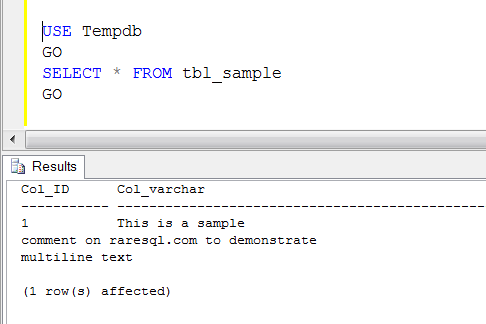 In this solution, we can copy and paste the same text covered with single quote and insert into varchar column. Given below is the script. Lets browse the table and view the record that is it updated as a multiline or not. Given below is the script. Opssssss, it is not updated as multiline in the column ;). Unfortunately if you view it in a grid it will not show as a multiline text. So to resolve it, you need to change from results to grid to results to text (Crtl+T).